While researching on the best ways to store our harvested and cured onions, we came across many examples of people using old pantyhose as a way to contain and store onions. The pantyhose allow for good air circulation and keep individual onions from coming into contact with one another. We cured our onions on our west facing front porch were they could keep dry and received a lot of hot afternoon sun. We cut the tops off of the onions leaving about 1 inch. Ideally onions should be stored in an area that is cool, moderately dry with temperatures around 32-40° F and relative humidity around 65-70%. In our house, the basement is the area that comes closest to meeting those requirements. I doesn’t get that cold in our basement and the humidity might be a bit higher (not sure). 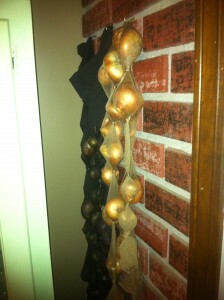 This year we are going to just hang our onions in a kitchen corner and see how long they last.